Get it while it's hot from the equally new Croquet Consortium web site. Qwaq Forums, the company's first product, is a secure virtual workspace application that significantly increases the productivity of distributed teams by bringing critical resources together in virtual places, as if they were in an actual physical location. A highly interactive and persistent environment, Qwaq Forums enables users to work, collaborate with others, and identify and solve problems. And I'm proud to say I contributed a little, which most probably will find its way into the next Croquet release. Update: Here's a few nice stories of fellow bloggers who have seen Forums already. Qwaq will get traction only because they completely understand that giving someone a semi-trailer truck (i.e., an engine like There or Second Life) doesn't do much good if the person has a small garage and needs a vehicle to go get groceries and tool around (90% of collaborators). Qwaq Forums is a powerful, easy to use and navigate, co-creation space that the rest of us can use. Unlike most traditional web conferencing which works only while a session is underway, Qwaq Forums is persistent. This means authorized users can access the virtual space any time. Team members in another time zone may wake up to find the results of real-time collaboration that occurred while they were sleeping. 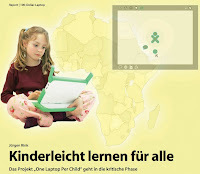 Many people still have not seen the innovative display of the OLPC project's "XO" laptop. It has twice the resolution of a regular LCD (200 dpi), and works in bright daylight in gray-scale reflective mode. It's impossible for me to increase your screen's resolution by software, and I cannot make your display reflective, but here is an interactive simulation of the backlight mode with its interesting color pattern. This pattern is the source of a lot of confusion about the "color resolution" of the display. The LCD has 1200x900 square pixels, but the backlight puts a full color through each pixel. It is not made of red, green, and blue sub-pixels like a regular LCD, but the first pixel is full red, the second green, the third blue, and so on. The DCON chip (Display CONtroller) selects the color components from the full-color frame buffer. My simulation of the DCON achieves the same effect by selecting either the red, green, or blue color component in each pixel. Just move the mouse pointer around to see how different colors are reproduced. You'll notice strong diagonal patterns, but remember, on the actual display the pixels are only half as large. Note that the actual DCON optionally applies a bit of anti-aliasing in hardware which is not simulated here. It helps reproducing fine structures and depicts colors more accurately. Additionally, the simulation shows a magnified image to better illustrate the principle, but it is not accurate because the reflective area of each pixel is not depicted. Maybe I can add this in a later version. I made the simulation using Squeak / Etoys, which is one of the programming environments on the OLPC machine, but also works on Windows, Mac OS X, Linux, and many more systems. 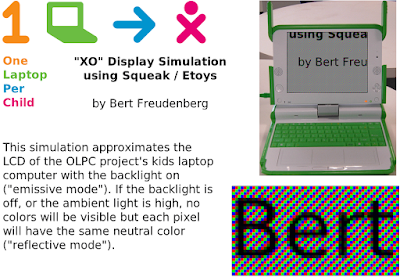 If you run the simulation on the actual laptop (download the project, place it in /home/olpc/.sugar/default/etoys/MyEtoys, run Etoys, choose Load Project), then you should close the small simulated screen and just leave the magnified view open. 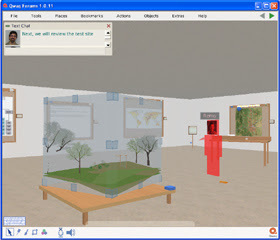 For the interactive simulation, download Squeak (this version installs both, a regular application and a browser plugin), then click here to run the simulation in your browser, or download the project file, launch Squeak, and drop the project into it. Intel-Mac users beware, the plugin is not supported directly yet. To see the project in Safari, you have to quit Safari, set it to open in Rosetta (select Safari in the finder, press Cmd-i), and reopen. Or, use the download method, Squeak itself is running fine on Intel Mac, it's just the browser plugin that's making problems.